We went to see Bauhaus at the Wiltern on Saturday night. We were pretty happy when we found out they were playing. When we had to miss Coachella earlier this year, this was on of the bands that we were really disappointed about not seeing. Our seats weren’t the greatest, we were in the second last row of seats. But the Wiltern is small enough that even these seats weren’t terrible. We were expecting an opening band, but there wasn’t one. Luckily our timing was perfect, the lights went down as soon as we sat down. The band sounded good, but there were a few times I heard some feedback that was a little annoying. Peter Murphy’s voice was great as usual. The stage was pretty bare except for the usual instruments and amps. The light light show was pretty snazzy. Unfortunately the lights meant that I wasn’t able to get any pictures at all. 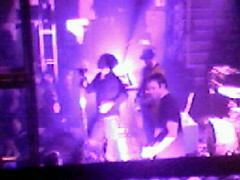 For one song, Daniel Ash took a break from his guitar and played the sax, which was pretty cool. For there main set, they played for about an hour, playing a variety of Bauhaus songs. They took quite a few minutes to come out for their first encore, making the crowd work for it. The first encore they only played one song and left again. After a little bit they came back out and played a Love and Rockets songSlice of Life from Burning From The Inside. Daniel Ash was singing, so Peter Murphy was just playing the tambourine and singing a little back up. They then played T-Rex’s Telegram Sam, and Bowie’s Ziggy Stardust. After the second encore, they left the stage and the house lights come on in the theatre. We just looked at each other and said “What? They aren’t going to play Bela Lugosi’s Dead?” We were a little disappointed and started leaving the theatre. But then we heard the crowd starting to get a little louder and decided to go back in. The crowd was getting louder and many people were shouting “Bela”. They then turned the house lights back off and the band came back on and did play the song everyone was waiting for. We saw the She Wants Revenge show at the Troubadour on Tuesday night. 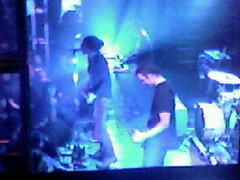 The show was very good with Monsters in Waiting and Viva K as openers. Indie 103.1 has been playing “Tear You Apart” by She Wants Revenge recently and I really like this song. Their album was supposed to be released that day, so I went to a few record stores to buy the CD, but no one had it. It turns out the album was not released for some reason. Before the show we went and had dinner at Flavour of India down the street from the Troubadour. It was delicious as usual. We also saw the guys from the band walk by us on the sidewalk as we were going into the restaurant. When we walked in the door and were showing our IDs someone walking out of the club said something like “ask about VIP badges”. We weren’t really sure what he was talking about, but the bouncer gave us VIP stickers and told us to go up the stairs when we got into the club. We went upstairs, showed our stickers to the bouncer and managed to sit in “The Loft”. It was great being able to sit and watch the show from up above instead of being stuck downstairs with the big crowd. The opening bands were both good. We liked Monsters in Waiting a lot, and Viva K were good too. We found it interesting that both bands had female lead singers with black hair. The place was pretty crowded by the time SWR came on. They started with a drum machine beat and then the four members of the band walked on. I was surprised to see four band members, because all the press always talked about SWR having just two members – Justin and Adam 12. I guess they added a guitarist and drummer for this tour. The show they put on was really good. The lead singer seems to have a real good stage presence. He engaged the crowd and seemed pretty friendly and relaxed up there, although he seemed a little overwhelmed that they were playing a sold out show at the Troubadour. At one point a girl screamed “Take your shirt off!”, and he just said “Never”. He also gave a little rant against their record company, encouraging people to phone them and ask for the record to be released. They sounded good too. The songs I was familiar with sounded much like the recorded versions. I think they played for about 45 minutes to an hour, but I really wasn’t keeping track of time. As many of the reviewers have said, they are very reminiscent of Joy Division. I think what reminds me of them is the very “kinetic” sound they have, dark yet danceable at the same time. After the show we went to the front room to see if we could buy a t-shirt but they were sold out. I regret not buying an EP. I can’t wait for the CD to come out. In the meantime I can enjoy some of their songs at their MySpace site. Sun Microsystems and Google are going to be joining forces to start promoting OpenOffice, the open source office suite. This is great news because I use OpenOffice, on my laptop, and on the iMac. Anything to popularize this will make it a stronger program. At first I was a little confused on why Google would be doing this, but as usual John Battelle gives an excellent analysis of what is going on. As part of the deal, Google’s toolbar will be downloaded with OpenOffice downloads, thus giving Google more presence on the desktop, pushing further into Microsoft’s home turf. Watching tech giants Google and Microsoft go head-to-head is going to be great fun. I can’t wait to see what happens over the next few years. It should be an amazing time as a user of technology to watch thing get better and better as they try to win users mind share. You are currently browsing the Toivo Lainevool’s Random Thoughts weblog archives for October, 2005.